Dove Cottage Nursery and Garden was conceived by us back in 1995. We opened Easter 1996. Our ethos has always been to enjoy our work, do a job to the best of our ability and use the best materials available. 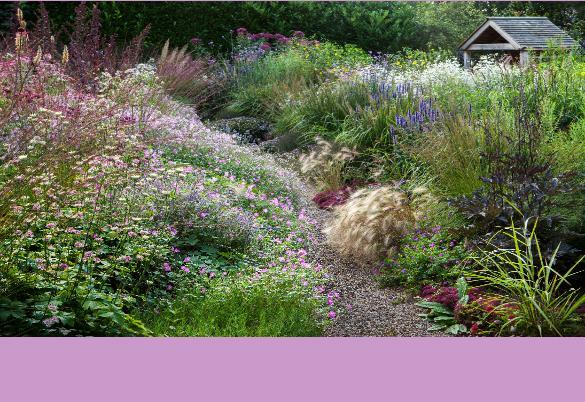 With this in mind over the years we have strived to create and maintain a 'special' nursery and garden which is home to a great range of perennials and grasses. Our land is behind Dove Cottages on a north facing hillside enjoying panoramic views of Shibden valley, Chelsea valley and a hillside of mixed woodland. The garden sits beside the nursery and is an intimate space enclosed by Yew hedges and green oak gates. 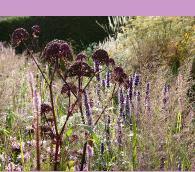 Fully and beautifully planted with late summer flowering perennials and grasses providing flower well into the Autumn. 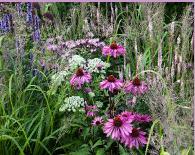 The planting combinations are superb creating a look of wild beauty throughout Summer, Autumn and Winter. Garden open from Sat 1st June on the same days as nursery. During September or October each year we try to treat ourselves to a 'plant hunting trip'. We have visited nurseries and gardens in the Netherlands, France, Germany, Belguim and Luxembourg.These trips are always exciting and rewarding. You can view or download our 2019 Catalogue as a pdf document, from our downloads page. If you would prefer to receive a printed copy of our current plant catalogue, please send a cheque for £2 to the address on our Contact page and we will be happy to post one to you. The beautiful images throughout the site are by kind permission of Marianne Majerus. More images at www.mariannemajerus.com. Shibden Hall Road Halifax West Yorkshire HX3 9XA Tel 01422 203553.